Mid-City – O Hei There! 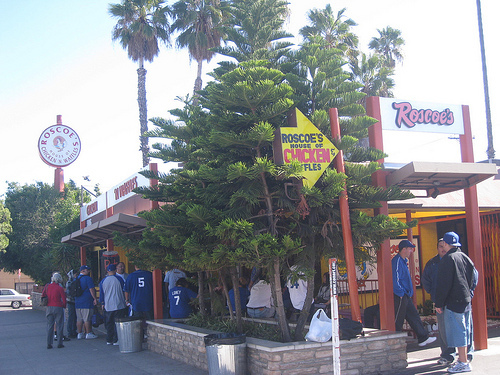 Roscoe’s Chicken and Waffles, oh the memories. I used to live a few blocks away from the restaurant in high school, and I would come here every couple of weeks late at night. It actually felt cool being the only Asian customer, and the servers always calling me “my man” and “sweetie” (depending on whether it was a male or female server). It made me feel at home, assuming I’m black of course. And the food was just good, comfort food. I mean, fried chicken and waffles – together? What an idea! In recent years, the warm feelings kind of faded away. The food was still good, but I just wasn’t excited going to Roscoe’s anymore. Some inconsistent meals contribute to this, but for the most part I think that I actually got bored of the food, after more than a decade of visits. But after we finished moving the last of the bulky furniture into the new apartment, Eugenia suggested Roscoe’s. Since my last visit to the restaurant was last year, I had no objections. This has become my favorite thing to get at Roscoe’s in recent years. 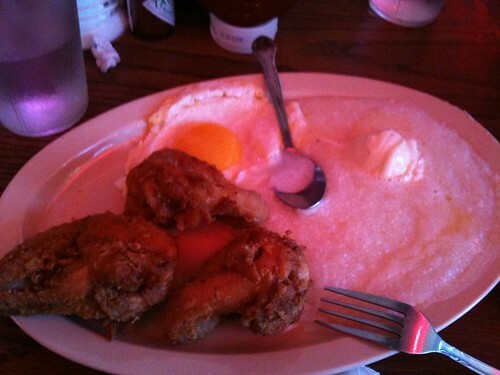 I think that the wings are the most well-cooked and well-seasoned chicken that they serve, and nowadays, I prefer grits with slabs of butter and a sunny-side up egg over waffles. Guess I’m just getting old. 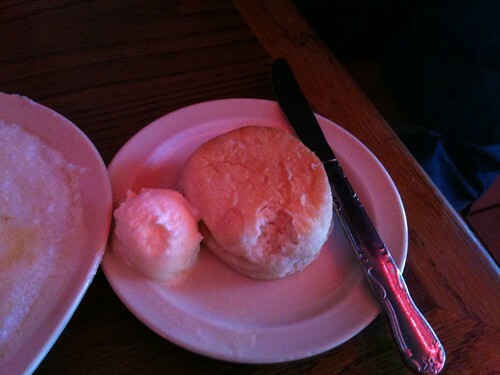 The biscuit has more of a bun consistency, but goes well with the butter as well. A satisfying dish on a satisfying visit. This most recent trip to Roscoe’s brought back some good vibrations, but nothing close to how I felt coming here when I was in high school. But I will be back occasionally, in an attempt to rekindle some of that old magic.